IS THERE A WAY TO PLAY DYNAMICALLY WITH TRIGGERS INSTALLED???? AND HAVE THE DYNAMICS HEARD THROUGH THE PA WITHOUT SOMEONE AT THE BOARD MESSING WITH A FADER???? ddrum triggers allow dynamic playing. I can't speak for any other brand since I only use ddrum. You have no real reason to use triggers. Let your drums be natural. For me, triggers are only a tool to be able to hear notes that are more often missed by lack of distinction of the notes when playing very high speeds. Not to mention, it literally is impossible to play above 240 bpm at full volume for more than 30 seconds. Stop if you think that, that's is whats needed to play in my music genre. There is just practical double-bass applications in metal drumming that you need to be able to hear. Now hush. <b>Well, the reson why im using them is because im recording a new album and im making up my own sounds in the studio with roger linn drum machine. Like the one that prince uses. So, i want to recreate that sound live. 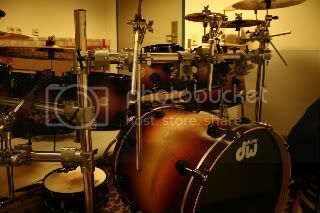 </b>Not every song i play is electronic on the album, i also use my DW kit too, to record with. Im just using Bass drums and snare sounds. And by the way i dont play double bass any more, i've learned double for single!!! You have no real reason to use triggers. Let your drums be natural. The part in bold is why he is using triggers. He therefore does have a reason to use them. That's the beauty of choice....you can choose to use sampled sounds and/or the natural drum sounds. On the album I just tracked, we triggered and mic'd the kick for one tune. The trigger was for an 808 kick sample because that is the sound we wanted. The sample track will then be mixed with the recorded drum track to get the desired effect. It's a dancehall tune and there is no double bass work, for the record. The bottom line is that using sampled sounds is an easier and more cost effective way to utilize different sounds live and in the studio and is most definitely not just for use in double bass applications. it's not so much the triggers, it's actually the module settings. The more 'sensitivity' you allow for, the more dynamic range you are capable of reproducing. It's all about the module. The triggers are pretty similar, physically/mechanically. They pick up what you play. It's up to the module to interpret it. I've used Roland triggers on bass, snare and toms and they can pick up whatever you want/need them to. as far as mixing/soundmen goes, you'd just send that signal to the FOH to be mixed in with your acoustics and the rest of the band. I'm not sure if I'm understanding that part exactly; you wouldn't need a 'second pair of hands,' other than the pair that are already mixing the band. Last edited by m on Fri Jan 04, 2008 10:37 am, edited 1 time in total. Not to mention, it literally is impossible to play above 240 bpm at full volume for more than 30 seconds. 'anatomy of a ddrum trigger.' It's a nice breakdown of the Ddrum Pro units. If you've never used triggers, the pictures here might help the concept make more sense. Metaldrummer89 wrote: so in order to use triggers i need the trigger, wires, drum module, and some sort of bass amp...does anyone know a cheap way to do all this? a pack with all of this included maybe? I don't know how you would hook it up to a bass amp, they're typically hooked up to the PA. I know they sell a trigger amp but it's $600. Other than that just buy a good set of headphones. through its 1/4 inch ouput? Hmmm... well if you know anything about the new deathcore movement. There is a song by As Blood Runs Black called "My Fears Have Become Phobias" that happens to be untriggered. I watched him play it live and actually sat behind him on a stage. The dbl bass roll at the end is disgustingly fast and he did it with ease and an absolute ton of power. I solved my trigger mounting issue; the same peice of rubber that works for pedal clamps works for Ddrum triggers. I adjusted the muffle I made and they seem to be tracking properly now. i dont like triggers becuase i like the sound of natural drums. they can be cool in some extreme metal situations where speed and clarity is of the utmost imortance...but as someone already mentioned you cannot get much dynamic range. if you play to soft you wont get the trigger to respond, if you play too loud the trigger will misfire or double trigger or do something else wrong. also triggers are unforgiving. if you are slightly off you sound like a complete idiot. acoustic drum sounds give you a little space to be on the front or the back of the beat. as someone already mentioned you cannot get much dynamic range. if you play to soft you wont get the trigger to respond, if you play too loud the trigger will misfire or double trigger or do something else wrong. This just isn't true anymore. It's all about the module here; modern triggers are able to transmit subtle nuances of playing style, but the module has to be able to reproduce it. Some are up to the task, others aren't. I think it's more a case that today most people aren't trying to get much nuance out of triggers, they just want a solid, consistent bass hit. If you want dynamics and nuance, you can get it with the proper setup and settings. also triggers are unforgiving... acoustic drum sounds give you a little space to be on the front or the back of the beat. I agree with this statement, we were discussing a similar topic in another thread, I think it was about learning to drum on E-kits.